With the school holidays beginning at precisely 3:01pm Friday afternoon, so for the next 21 days, you can expect the local waterways to be inundated with junior anglers wielding the latest and greatest 6’6” combos in every colour of the rainbow, sand castles and sand traps will be found in places you would least expect and young paddlers will be testing their skills on kayaks, paddleskis and inflatable boats shaped like a giant purple lobster! The school holidays also mean record crowds at beaches, long queues at the shopping precincts and bad drivers inadvertently putting your blood pressure through the roof. So with that in mind, I still know where I would be – on the water with the kids enjoying what the river has to offer! So how do you keep the kids happy with a relatively low-cost stress-free fishing trip to one of those spots in our back pockets (and away from the traffic and shopping mayhem)? Take some time out to hit the water and target the four following species which will make up the majority of catches from now until summer. Hopefully the kids will end up with a few in their buckets and take a good story back to school to share with their friends. Whiting: The bread and butter species targeted by young and old anglers who love a challenge with light line as well as the reward of sweet tasting fillets that melt in your mouth. Whiting feed on shallow sand or muddy yabby banks throughout the local rivers. Try Maroochy River Mouth to Black Banks, The Sand Basin and La Balsa Park at Mooloolaba, Munna and Culgoa Points in Noosa and just inside the Caloundra bar. Best results are usually on the bigger high tides around full and new moon phases during summer. Whiting will forage in the mud feeding on small worms and crustaceans as they move along the banks. Blood worms, yabbies, soldier crabs, small pipis and sand worms are all part of the whiting’s diet. Recently anglers have been using small poppers no more than 4cm long to bloop over the banks on the making tide for quality whiting. The Gulp sand and blood worm varieties have proven to be an effective soft plastic on whiting in the rivers. Flathead: The ultimate ambush predator which loves to feed up on the banks during high tide and hang on the edge of drop off when the tides going out. They also love to feed around creek mouths, deeper holes, weed beds and river bends. Flathead will eat a wide variety of baits including live bait in the form of herring or mullet, fresh prawn, small pilchards and flesh baits. Soft plastics have been the most successful way to target flathead yet. Flathead, being the gullible fish they are, will hammer most forms of soft and hard lures which pass their nose. Fish all drop-offs and shallow beds in Pumicestone Passage, Currimundi Creek, Mooloolah River and Canals, Maroochy River and Noosa inlet. Also worth fishing gutters along the surf beaches for bar-tail and dusky flathead. Trevally: Found usually on the high tide feeding around the schools of herring and prawns. They move throughout the rivers stopping at the usual creek/canal entrances, deep holes and channels, bridge pylons, rocky areas and along the edge of weed beds looking for moving bait. Basically find the schools of bait and you will usually find some trevally. These fish were built for speed and are born lure chasers. Some of the better tried and proven lures include: 20g Surecatch Knights,River2Sea Bubble Pop45, RMG Scorpion 68, Prawn Star Shrimp and Powerbaits in the 3inch size. All river systems between Caloundra and Noosa are playgrounds for these fun fighting fish! Mangrove Jacks: A ‘jack attack’ occurs when a solid mangrove jack departs his snaggy home, does a 180 degree turn and smashes the lure or bait on his way back to the snag. By the time you strike, the Jack already has your line entwined in his snags and you are instantly busted off as the tight line touches one of the many oysters attached to the snag! Not all mangrove jack hit this hard and fast around snags. They tend to move away from their snag into open water overnight. Target Jacks around fallen trees, rocky areas, mangrove roots, concrete pylons and deep holes holding bait – we have plenty of these structures in around McKenzies Bridge, the Cod Hole and Noosa Sound. The best bait for jacks is always live - like mullet, herring, prawn and gar. They will also slam mullet fillet and pilchards when extra hungry. Hard bodied lures like the C-Lure “Jack Snack” and most softies like 3-4” Powerbaits work affectively on jacks. For the kids (and even big kids) who have been bitten by the soft plastic bug and want to practice their jigging, twitching and jerking techniques then give a WildEye Twitching Nipper a go! The WildEye Twitching Nippers by Storm have been on the market for a few years now and work really well in SE Queensland estuaries for a wide variety of species. Recently Storm released an unrigged version of the Twitching Nipper in Australia and it has been a huge success with a broad range of fisherman. WildEye Twitching Nippers are by far the most realistic soft plastics lure on the market because they are a dead ringer of the saltwater yabby in shape and size. They come in a wide range of colours that include a natural colour that is the same as the native saltwater yabby, a pink colour, pumpkinseed and orange. Storm has released two sizes of Twitching Nipper in Australia to replicate the average size of the local yabby, these include a small 5.5cm specimen and a bigger 7cm version. Nearly every species of fish in the river will feed on yabbies at some stage of their lives; even vegetarian species like luderick have been known to eat yabbies at times. I believe this is why when you use the Twitching Nipper you could literally catch anything . Noosa: Whiting, bream and tailor to 4kg between North Shore and Double Island Point. Mangrove jack and trevally on lures between the Lakes and also at night in Noosa Sound. Whiting throughout the lower reaches of the river. Flathead in Weyba Creek. Maroochy: Tailor and whiting in the surf between Marcoola and Pincushion Island. Bream and chopper tailor around Goat Island. Whiting on bloodworm and small poppers throughout the lower reaches. Flathead on prawn-style lures in the Cod Hole, and from Godfrey’s Rd to Bli Bli. Try for jew on the evening high tide. Caloundra: School mackerel and tailor taken off the rocks at Moffat Beach. Whiting and flathead just inside the river mouth and along Golden Beach. A few flathead on lures in the mouth of Bells Creek. 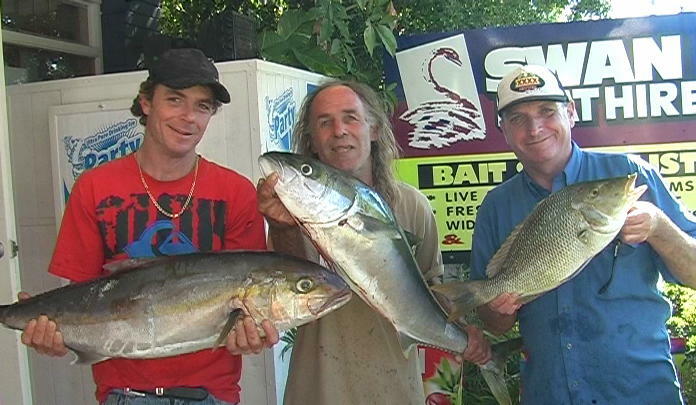 Try for jacks and trevally in Pelican Waters Canals. 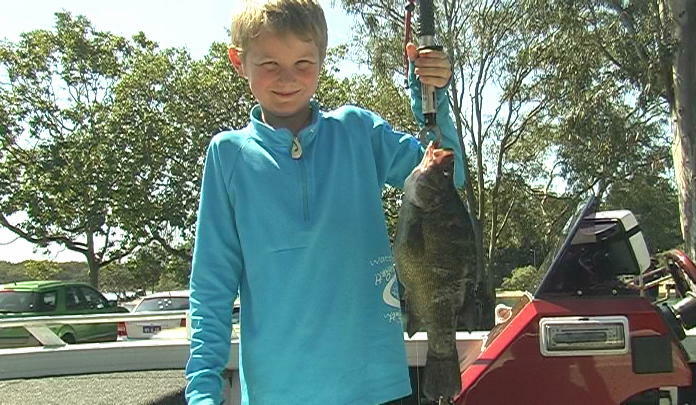 Zayden Gladman proudly holds up a golden perch caught at Borumba Dam on a spinnerbait. 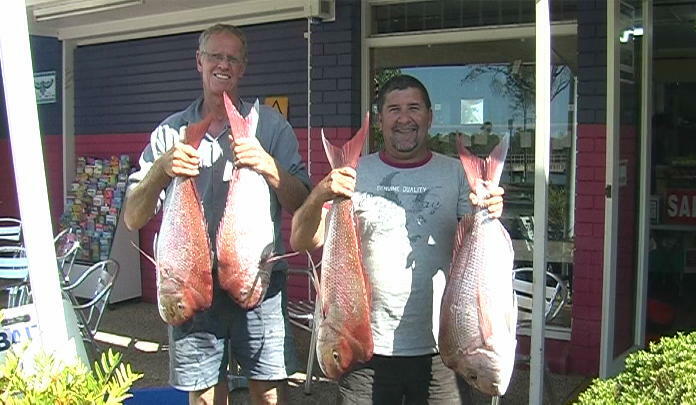 Ken, Ollie and Mark spent a day bonding at Murphy’s Reef and took home amberjack, yellowtail king and spangled emperor. Dave Plum and Micheal Wilkinson were all smiles after boating these 5kg snapper at The Hards! 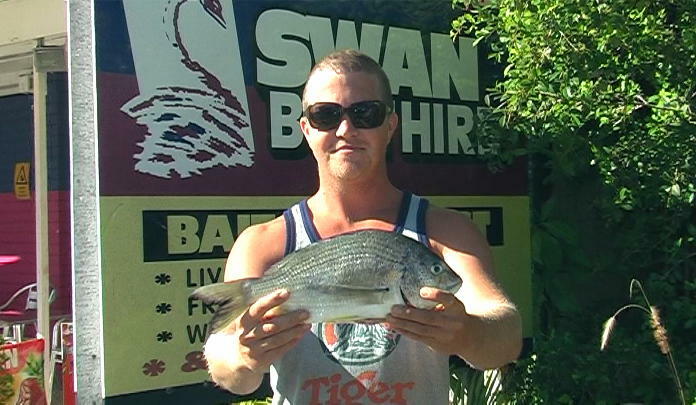 Shane Powell fished the run out tide near Goat Island to target this 900g bream on fresh prawns.